SmartSource Expert Elite Scanner | Printers | UniLink Inc. The SmartSource Expert Elite scanner adds a standard 100 Base-T Ethernet connection and built-in intelligence to the popular SmartSource Elite series platform. 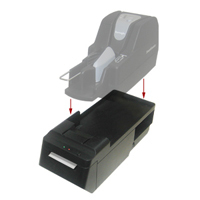 The Expert Elite includes all of the features that make the Elite series an ideal check scanner for teller and remote deposit capture applications including a small footprint, durable design, high speed, and industry leading image capture of checks and ID cards. In addition to an Ethernet connection, the Expert Elite scanner is capable of performing all required image and MICR processing while maintaining rated throughput. Built-in processing incorporates double-document detection, MICR recognition, OCR recognition, combined MICR/OCR recognition, image clean-up, thresholding, cropping, and compression.